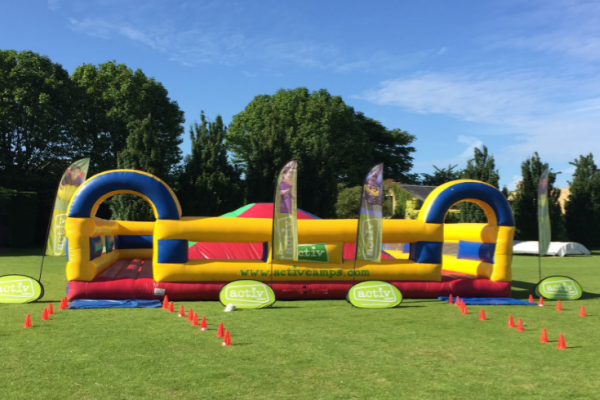 We have a huge range of inflatables, along with lots of fantastic fully qualified staff that can be hired for either a full or half day. Great for summer fairs, charity events or street fairs. Height: 2.7m. Length: 9.6m. Width: 3.6m. Height: 3.5m. Length: 10.7m. Width: 10.7m. Height: 6.5m. Length: 10.7m. Width: 7.3m. Height: 5.6m. Length: 6.7m. Width: 5.7m. Height: 3.2m. Length: 10.0m. Width: 3.6m. To run an inflatable at your location we need a grass space big enough for the inflatable itself (see sizes above) plus a 3m parameter around the inflatable. If you do not have a grass space, we are able to run an inflatable on a hard surface, however there must be enough fixed points to attach the inflatable to (e.g. tennis course fencing, trees, lamp posts, bike racks etc.). This will require a specific risk assessment, which will consider the suitability of your venue. If you are unsure whether your space will be suitable, please don’t hesitate to get in touch and we can provide some assistance. We can visit your venue prior to the event to complete a full risk assessment. Can the inflatables be used in bad weather? Can we run the inflatables ourselves without your staff? What sort of surface do you need for the inflatable? Can your inflatables be used indoors? Is there an age limit for children using the inflatables? Our inflatables are fine to use in a light rain shower, however in heavy/persistent rain or in high winds, the inflatables should not be used. Our fully trained staff will be on site to make the decision in the event of bad weather. We will arrive up to 2 hours prior to the start of your event to set up the inflatable. No, for insurance and safety reasons we must deliver, install and run the inflatables ourselves. 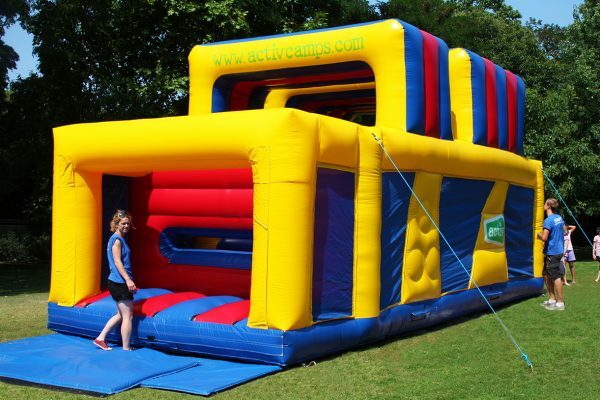 Yes, providing you have enough space in your venue to fit the inflatable and there is step free access to the venue. We would have to visit the site to assess whether it would be possible, but please get in touch and we can discuss the options. All of our inflatables fully comply to the latest Health and Safety Executive guidelines and have current safety certificates. 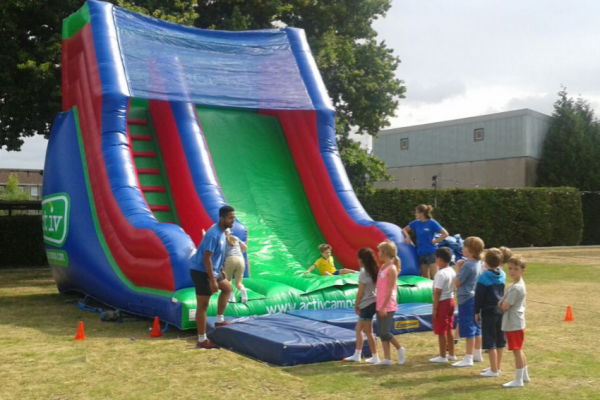 We also will provide our fully trained staff to run the inflatable, so anyone using them will be supervised. 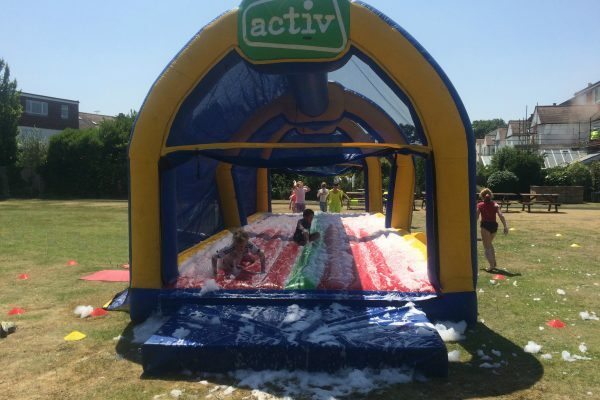 Activ Fun Days, a trading name of Activ Social Enterprise Ltd, has insurance limited to Employers’ Liability, Public and Products Liability with Activities Industry Mutual (AIM). Legal liability as an employer for a limit of £10,000,000 and Public and Products Liability for a limit of indemnity of £5,000,000. The insurance policy for Activ Fun Days does not provide insurance cover in the event of cancellation or personal accident for any participant. if you wish to discuss any matters regarding insurance cover. Please contact the Activ Fun Days team if you wish to discuss any matters regarding insurance cover. 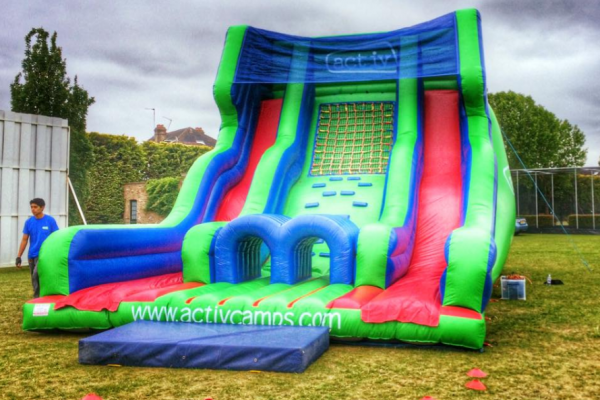 Yes, all of our inflatables are suitable for anyone aged 4 years and older. Parents wanting to take any children under the age of 4, are able to do so, but they must go on the inflatable with their child. 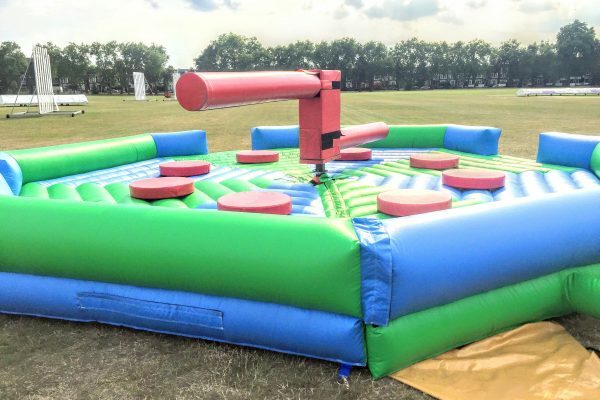 If you would like to hire one of our inflatables, please fill out the form below and one of our team will get back to you to discuss your enquiry.